Après… the term used for post-skiing drinks and relaxing with your friends after a day on the slopes. 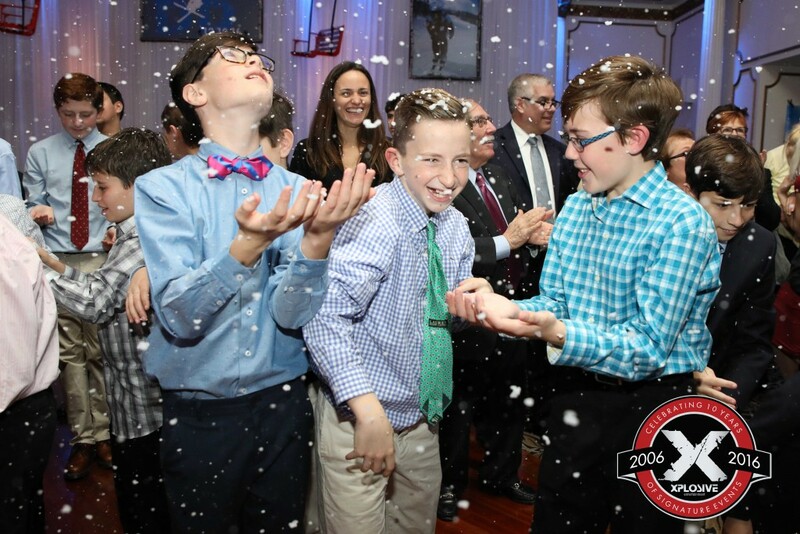 Blake’s Bar Mitzvah took this Après theme to another level. (The best part was, none of the guests had to fight their way down a freezing cold, snow-covered mountain in order to enjoy the party). Our host family has taught Blake the art of skiing throughout the years. Therefore, this became the obvious choice for Blake’s bar mitzvah theme. This theme came to life so incredibly by the trifecta hired to make the magic happen. The scene was set at the angelic and immaculate Crystal Plaza located in Livingston, NJ. 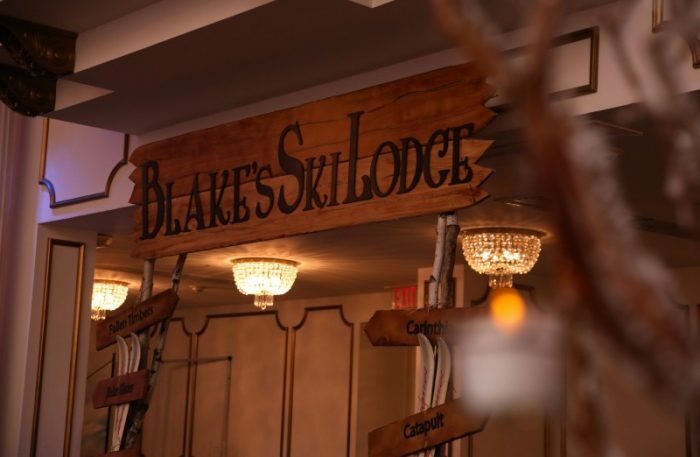 The rooms within Crystal Plaza warmly greeted Blake’s guests with an elegant, yet historic appeal. Living up to it’s reputation, the Crystal Plaza provided an amazing selection of food for guests to enjoy while delivering perfect service. The décor was impeccably planned. Debbie’s-Designs created an authentic ski lodge feel within the main reception space. The kids lounge was built from stained wood tables while the adults sat at burlap covered tables adorned with foliage and candle center pieces. 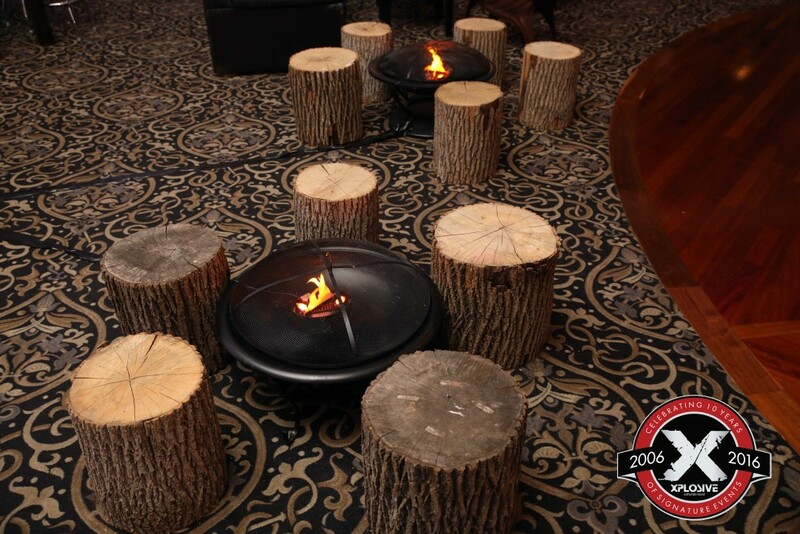 The kids lounge featured indoor (faux) fire pits surrounded by Adirondack chairs. There were even real tree stump seats for kids emulating a true outdoor feel. 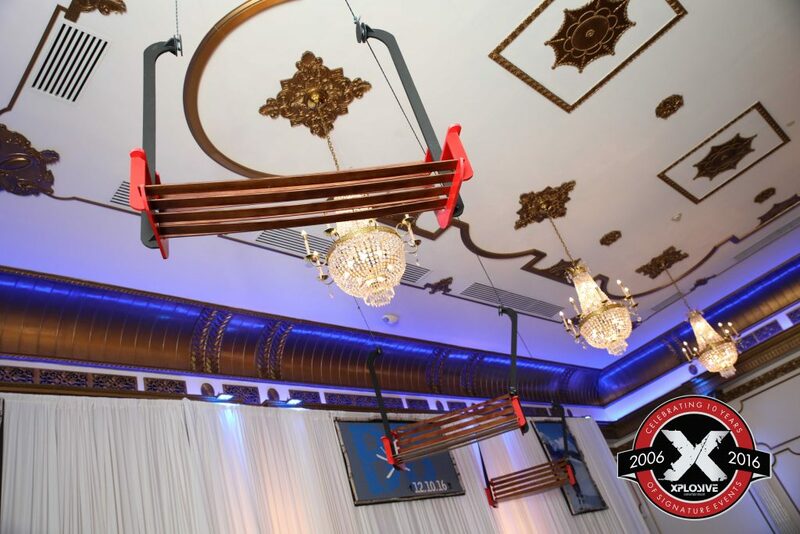 Above head, an authentic ski lift was strung from one end of the room to the other. 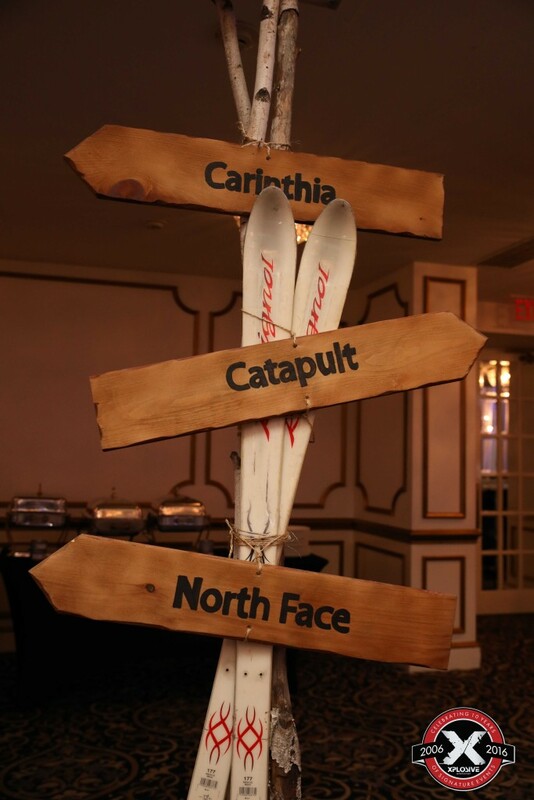 All throughout the room, guests found unique ski and mountain inspired details perfectly positioned. 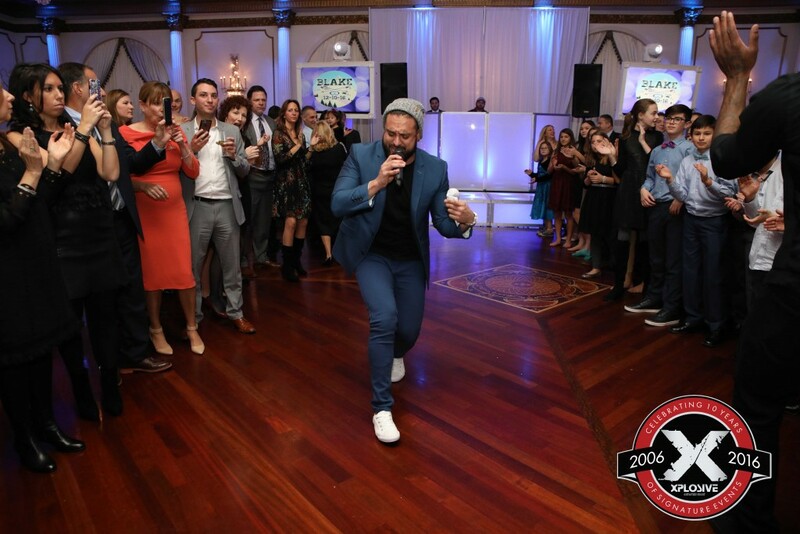 As for the entertainment provided by Xplosive, the team was led by Xplosive Entertainment’s owners, Jordan Marshall and DJ Michael T. Xplosive’s event ignitors were decked out to compliment the theme . Ski hats, gloves and scarfs were a must for this soirée. The visual content displayed on the large flat screen TVs included a custom created logo positioned over a variety looping tranquil snow scenes. 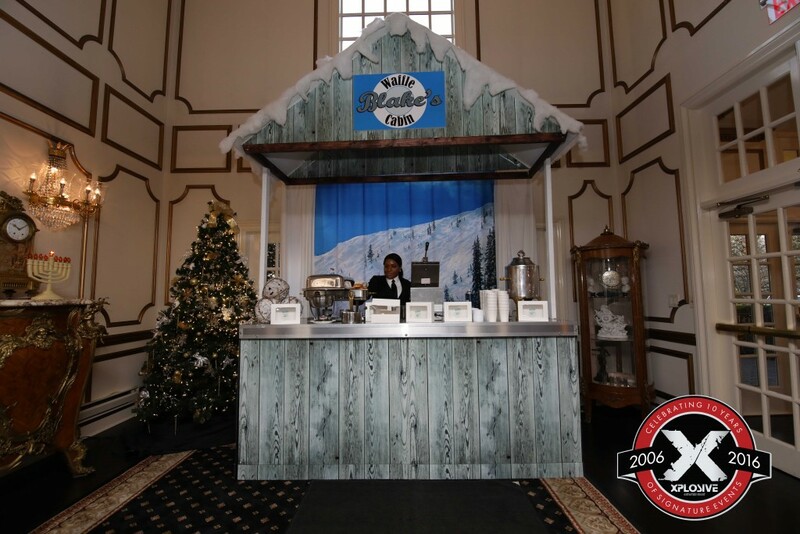 At several points throughout the night, guests experienced an indoor snow storm effect and ice cold air blasts provided by a CO2 jet system. Xplosive’s stage setup included large white stages lit in a cool blue (described to look like giant ice cubes) white drapery, and custom built white crown molding frames for the TVs. The photo station, also provided by Xplosive, had a very unique ski themed touch. Guests sat in a realistic looking chair lift appearing ready to ascend to the top of the mountain. 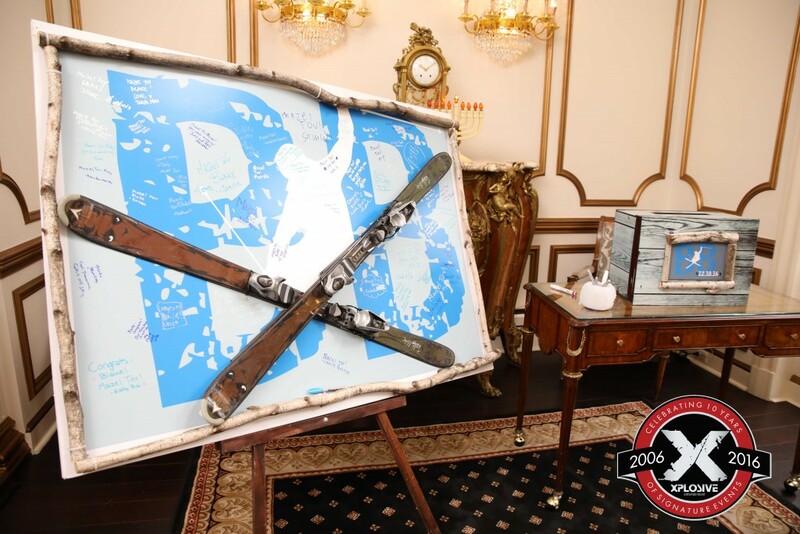 Ski props including helmets, goggles, ski poles and even real skis helped guests get into the snowy theme. While sitting in front of the custom ski slope backdrop, guests were able to choose from either printing a framed photo or they selected to create their very own flip book showing animated fun! The photo station also posted images to guests’ social media pages and even had a text to phone options for the images to send instantly to their phones. After five hours of non-stop fun, guests said their goodbyes. Upon exiting the Blake’s Ski Lodge, they were greeted with one last ski themed surprise. Waffles! Yup… no visit to a mountain would be complete without a warm waffle and toppings to go. 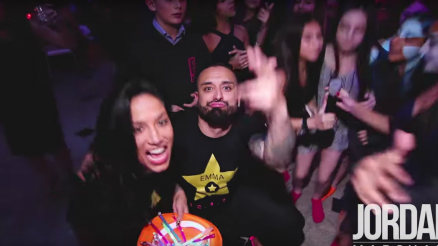 This party was a perfect example of clients with a vision! Hiring the right team to bring the event vision from concept to reality was a must. Mazel Tov to Blake and your incredible family!